Another delay for its Gorgon LNG project and the lingering fear that its dividend isn't in great shape has been two of the biggest headline grabbers for Chevron this year. There certainly wasn't a lack of bad news headlines for oil and gas companies this past year, and Chevron (NYSE:CVX) was no exception. Of the oil majors out there, Chevron is the most dependent on oil and gas production for its profits, so its shares have been hit especially hard compared with better-performing peers such as ExxonMobil (NYSE:XOM) and Total (NYSE:TOT). 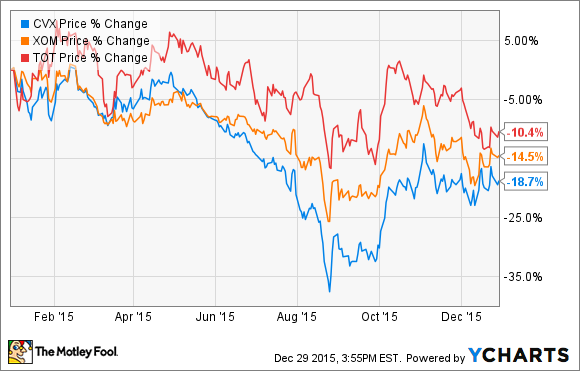 So what has left Chevron hurting that much more than its peers this year? Let's take a quick look at two of the biggest news-related themes for the company this year and how they have hit shares so hard in 2015. If there's any project that needs to be completed and brought online, Chevron's Gorgon LNG facility is it. As the operator and 50% owner of the $54 billion facility, Chevron has pinned a large portion of its growth plans on the successful execution of this project, as well as its other Australian LNG facility, Wheatstone. Gorgon was initially projected to cost $37 billion and expected to come online back in 2014, but the company has run into a myriad of issues with the project that have blown out the budget and pushed back the company's projected completion date to the end of 2015. So when August rolled around, Chevron's management announced that it was delaying the first LNG cargo deliveries from the second half of 2015 to the first half of 2016. The company said that it was due to labor disputes and bad weather, but there was also the issue that it might not be able to find a buyer right now, with LNG prices as cheap as they are. The sooner Chevron can turn this project into a cash-generating asset, the better. If weak oil prices and lackluster earnings weren't enough bad press for Chevron in 2016, the fact that the company still needs to spend big bucks on these development projects has several investors nervous that it isn't generating enough cash to meet its capital obligations of expenditures and dividends. So far this year, the company has needed to sell off several billion in assets and tap the debt market an unusually high amount to meet its spending needs. That was even after eliminating the $5 billion in share repurchases the company executed in 2014. Covering dividend payments with debt is not unique to Chevron. So far this year, just about every integrated major has done so. The biggest difference between Chevron and the others, though, is that it its spending rate is outpacing its ability to bring in cash at a much higher rate than its peers. At just about every opportunity, CEO John Watson has said that the company will adjust its spending such that by 2017 all of its development spending and dividend payments will be covered by cash flow from operations and that the dividend will not be cut. With oil prices below $40 a barrel, though, it could really skew the economics of the company's business and might make that a hard goal to achieve. A few extra months to wait for Gorgon to come online isn't enough to kill the company's prospects for 2016 and beyond, but it certainly could leave a sour taste in investors' mouths when Chevron does decide to take up any other major development projects, such as its proposed Kitimat LNG facility in British Columbia. After a few years, I'm sure that not many investors will forget all of the headaches these LNG projects have caused once all that cash starts to come in the door. If oil prices don't cooperate, 2016 could be another rough one for Chevron that will keep that dividend sustainability question in the air. Investors can hope that in the next few months, the company can get some of these non-producing assets online and start to wrap up this binge of spending that has caused management and shareholders a bunch of headaches.